A Christchurch shootings-style attack could have happened in the UK, the imam of the Finsbury Park Mosque in north London has said. Speaking from New Zealand, Mohammed Mahmoud said such an incident could have happened at home due to "a rise in Islamaphobia". In June 2017 Mr Mahmoud stood guard over a man who drove a van into Muslims in Finsbury Park. After the Christchurch attack, police have increased patrols at UK mosques. 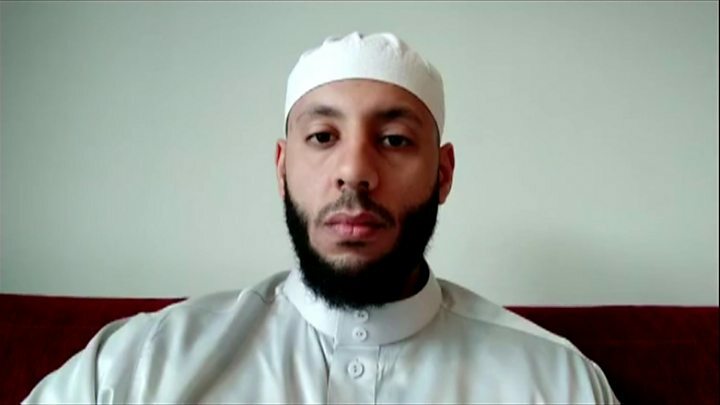 Mr Mahmoud was invited to New Zealand to take part in the response to the attack at two mosques, which killed 50 people and left dozens more wounded. "We're very aware an attack like this could have occurred in the UK, and we pray that it never does," he told BBC London. "We must learn that [there is] the real threat from increasingly violent and murderous right-wing ideologies, and white-supremacist ideologies, and the impact of Islamophobia." The UK could learn "how an entire nation can be united through good leadership" and through action rather than "rhetoric or soundbites", he added. Mr Mahmoud said he "had to" travel to New Zealand to "stand shoulder-to-shoulder, to unite as Muslims, to unite as human beings, against this terror and such aggression". "Given the scale of the attack it wouldn't have sufficed to send a letter or a video," he said. New Zealand's Prime Minister Jacinda Ardern has vowed to ban all types of semi-automatic weapons and assault rifles. A Home Office Spokesman said: ""Nobody should ever fear persecution of their faith, and we must unite against those who seek to spread hatred and divide us. "The Home Secretary has increased funding for next year's Places of Worship Protective Security Fund to £1.6m and allocated £5m over three years for security training."